Let’s start this post with the obvious ‘This skirt has a fabulous 50’s retro diner print’ and bright colors making it a stand out favorite!! Skirt is may the alternative UK clothing brand ‘Banned Apparel’ and they have a full range of vintage and retro inspired clothing items from skirts, dresses, shoes and more. I am a big fan of Banned Apparel and find their items to be top quality. Banned sells most wholesale but they do have a USA website as well. 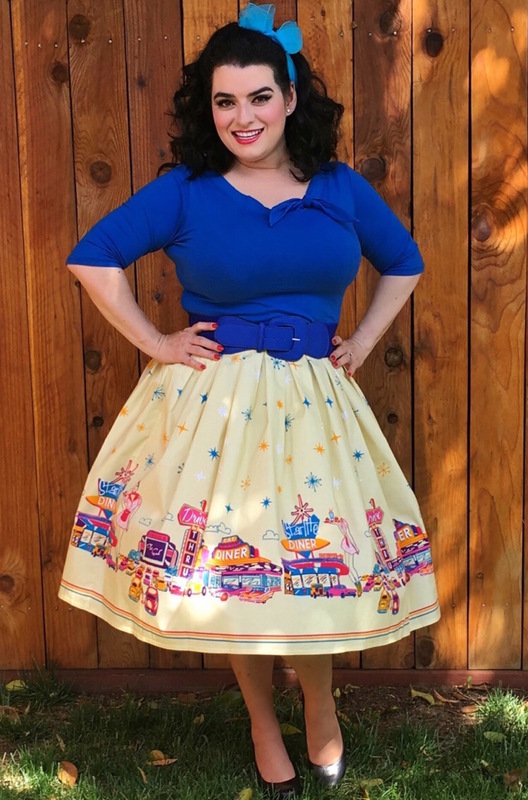 I first saw this stunning Retro 50’s Diner Novelty Border Skirt on the ShopVDM website and pre-ordered it immediately. The folks that run ShopVDM are delightful and ship very quickly. 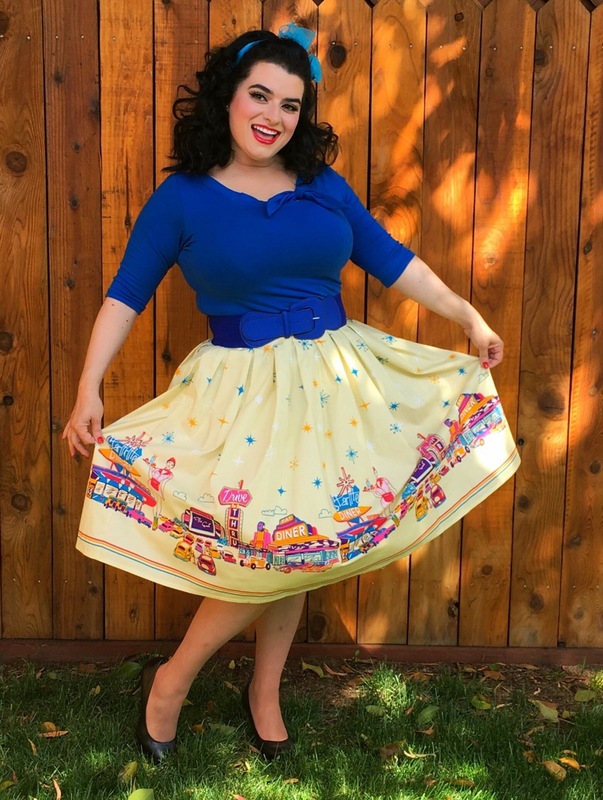 I was really excited when my skirt arrived and found it to be exactly as pictured with a soft yellow background with bright colors that make up the boarder print scene of a diner, waitress and classic cars; there are even atomic starbursts on this print!! The skirt is very light so it will be perfect for warmer weather. My hubby was really sweet and snapped a few pics of me wearing the skirt, I do have a petticoat underneath and love the shape it gives the skirt, I paired it with my Heart of Haute Lilly top in blue and added a wide belt. I am wearing the skirt in a size XL and find it fits true to size without stretch. I think this will be a favorite of mine to wear to the upcoming classic car shows. Pair this one with a fun novelty bag and you ready to go out for the day!! ShopvDM is taking pre-orders now for another round so hurry and get yours before it sells out! !